Leaving your wallet behind in the cafe? Nut app will remind you in time when you set in anti-lost mode. You can always set silent zone for home and work and silent duration at night. Leaving your phone behind outdoors? Nut Find 3 will make a sound to alert you.One Touch Find: Cannot find your car key while rushing to work? One touch to call it and find it with ease. Cannot find your phone when you are alone at home? Just One press on Nut app can easily find your phone. Millions of Nut app users can help you find your lost items back. Attach one piece of Nut Find 3 with the remote control, all your family members can easily find it.1 year standby and Replaceable battery. iOS 8 and above, Android 4.3 and above with Bluetooth 4.0. 1. Install the APP store to search the nut. 2. Please make sure that the bluetooth is open to binding the nut. 3. Operate the nut through the APP which can call the nut to check the nut position. 4. Set the nut which can adjust the alarm distance, open two-way lost to look for lost items. 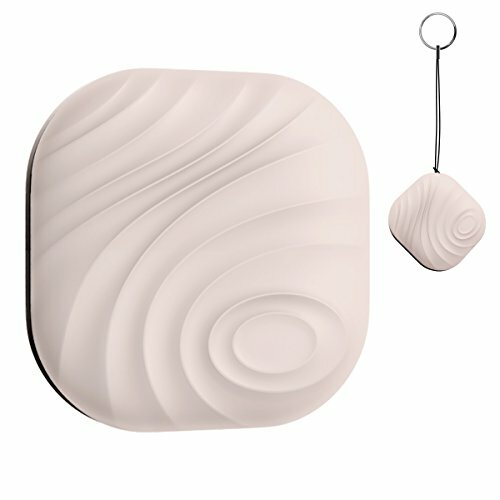 Cute and Mini:a small and fashion color design,original and nature,tracker with bluetooth that electronically connects with Apple or Android devices with a tiny electronic key fob that alerts the user if the device is more than 30 meters away. Safe with GPS Tracker: Track where your key ,wallet,phone if you are easily forget it by GPS,one touch find where it is.Avoid to be stolen by finding the map recording. Two Way Anti-lost:Smart anti-lost and phone left behind alert, phone and nut out of set distance, bi-directional alarm to avoid missing items. Have anti-lost and find it dual modes and silent zone. Compatiblity and APP Control:Compatible with IOS 7.0 system and Android 4.4 system version/bluetooth 4.0. Nut app works together with Nut smart trackers, easily control your items, finding things has never been easily.